Hanoi (VNA) – A concert featuring Vietnamese and Spanish sounds will take the stage at Vietnam National Academy of Music (VNAM) on October 7, with performances by pianist Mario Mora, the Hanoi Philharmonic Orchestra and conductor David Gomez Ramirez. Nights in the Gardens of Spain concert will engage music lovers in a musical round-trip from the gardens of Andalusia to the mountains of Sa Pa. The concert will be held to celebrate the National Day of Spain, and it will combine Spanish pieces by Manuel de Falla and Nikolai Rimsky-Korsakov with a few select symphonic orchestrations of Vietnamese ethnic folk music arranged by Dang Huu Phuc. In the show’s first section, Mora and the orchestra will play Nights in the Gardens of Spain by Falla (1876-1946). The piece was composed in 1916 when a 20-year-old Falla was firmly part of the Romantic mould and under the influence of Chopin. After the intermission, the show will offer eight pieces of Vietnamese folk songs arranged by Phuc and Spanish Capriccio by Russian Korsakov. Ramírez, lead conductor of the Lira Saguntina Symphonic Orchestra and Choir, will conduct the orchestra. Ramírez is considered one of the most promising young conductors and composers in Spain. In 2010, he received the Giraldillo de Oro prize, Spain’s highest award given by the Cultural Arts and Sciences Association. He has also served as a resident conductor in Seville and Coutances Orchestre in France and has guest conducted around Spain and Western Europe. His work with Asian orchestras includes Hanoi, Hue and HCM City. He returns to Hanoi with pianist Mora, a rising talent of the Spanish musical scene. 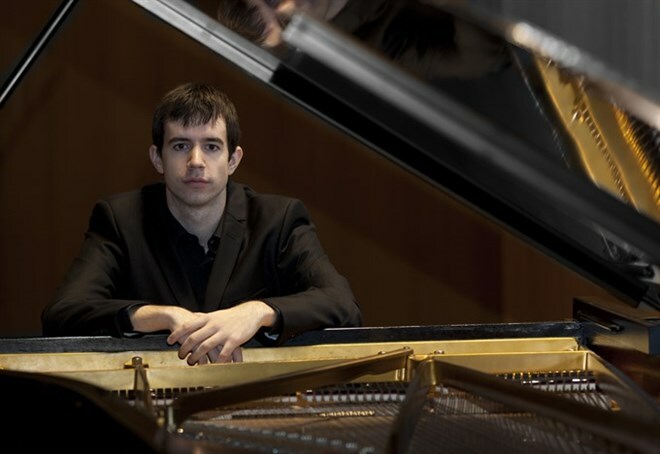 Mora graduated from Cuenca Music Conservatory and continued his studies at Madrid’s Royal Conservatory of Music and the London Royal Academy of Music - where he obtained his Master of Arts with Honours and the Examination Prize for the best overall final recital. When only 15 years old, he made his solo debut with the Cuenca Youth Orchestra; he has since played with the prestigious Spanish Radio-Television Symphony Orchestra, London’s Harmony Sinfonia Orchestra and the Dulwich Symphony Orchestra, as well as several youth orchestras in Spain. Mario was appointed Professor at the Conservatorio Superior de Música de Castilla-La Mancha, where he is currently teaching Piano and Keyboard Musicianship in 2014.